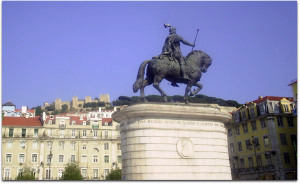 Lisbon Monuments - History and Culture at your service! There are so many great Lisbon Monuments that it will probably be very difficult to visit all of them in just one trip to Lisbon. The two most famous of all Lisbon Monuments are the Belém Tower (Torre de Belém) and the Jerónimos Monastery (Mosteiro dos Jerónimos). 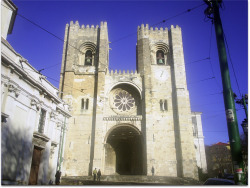 Both are located in Belém and are classified as World Heritage by UNESCO. Still in Belém you have to visit the Discoveries Monument (Padrão dos Descobrimentos). This monument is a tribute to the great Portuguese Age of the Discoveries (Era das Descobertas). It has multiple prominent people represented in this sculpture. In front of them all is Vasco da Gama, a symbol of this amazing time and leader of the first successful boat trip to India. 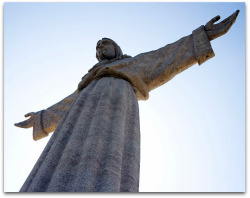 Crossing the Tagus River to the other side you have to visit the Monument of Christ King (Monumento de Cristo-Rei). Inspired in the Rio de Janeiro's "Cristo Redentor", this amazing piece of art allows you to appreciate a fantastic view over the city of Lisbon and the Tagus River (Rio Tejo). Near the 25 de Abril Lisbon Bridge (Ponte 25 de Abril) but on this side of the river, you can admire the Lisbon Aqueduct. 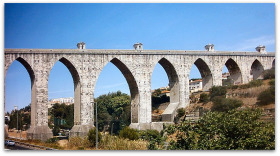 An amazing piece of engineering that survived the 1755 Lisbon Earthquake. If you like bullfights, don't forget to visit the Campo Pequeno's bullring and you can shop some souvenirs in the Shopping Centre below the bullring. Some of the most amazing monuments are the churches in Lisbon. Take for example the Lisbon Cathedral (Sé de Lisboa), perhaps the oldest building in Lisbon, and the Estrela Basilica (Basílica da Estrela). Also amazing are the Lisbon Palaces, like the Ajuda Palace (Palácio da Ajuda), and the Theatres (Teatros), like the Saint Carlos Theatre (Teatro de São Carlos). Go to the Lisbon Downtown (Baixa de Lisboa), take a picture to the Augusta Street Arch (Arco da Rua Augusta). After that, climb to the Saint George Castle (Castelo de São Jorge) and appreciate the great view over the city. Some train stations, like the Rossio Train Station, are authentic monuments more than worthy of a visit. Throughout the city you have Statues which are tributes to some of the most prominent people of Lisbon. Reminders of great events or achievements. This is omly a sample of the Lisbon Monuments available to you.